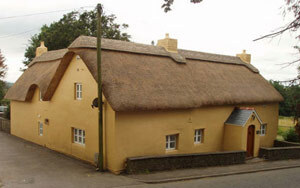 Welsh longhouse, Vale of Glamorgan, Wales. 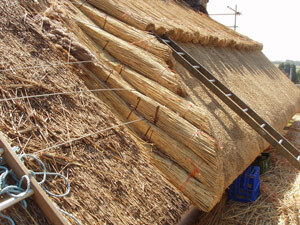 Thatched in Water Reed. 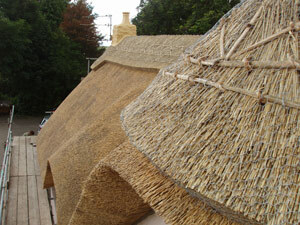 The owners requested that it be thatched in water reed. 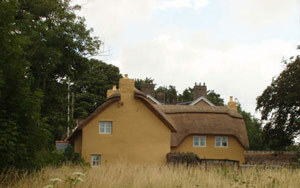 The reed was supplied by a colleague in Orford Ness near Ipswich in Suffolk. The reed is vary similar to Norfolk reed having a high wax/silica content. 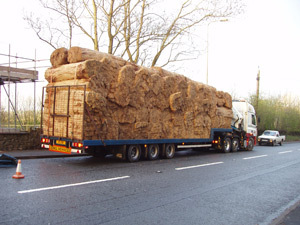 It was trickier to arrange the transport from east Anglia than it would have been transporting imported reed from mainstream suppliers, however I believe this home grown reed to be of a very high standard and well worth the effort. Having been in the reed beds and seen how well it is managed I can say that there is a longer conservation view in encouraging the supply of home produce as this helps secure the tradition is kept alive and more importantly the knowledge. The owners wanted a block ridge to cap the roof, however now that they have thought about it they tell me they will go for a traditional flush ridge next time round.